The Indian Point nuclear power plant is on the banks of the Hudson River, just 38 miles from New York City. 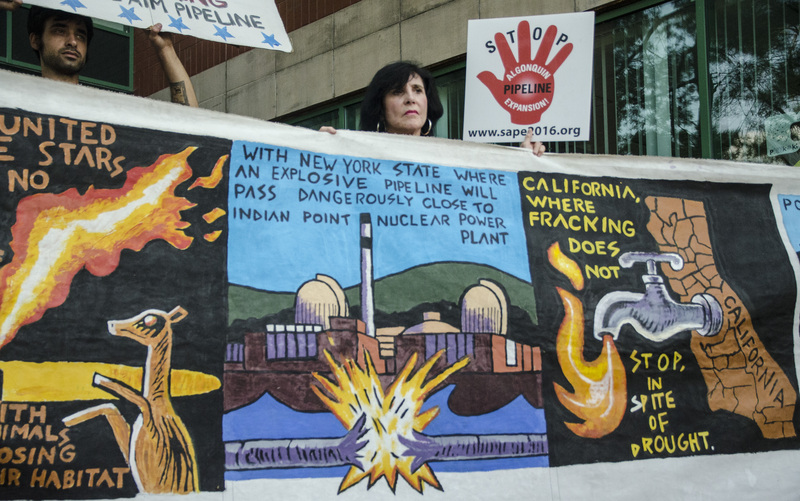 BCJN, in its alliance with Bronx Climate Justice, South Bronx Unite, the NYC Grassroots Alliance, and other NYC and NYS groups, is an active proponent of permanently closing the Indian Point nuclear power plant. We are a coalition member of Shut Down Indian Point Now! Please see our Open Letter to New York Elected Officials, “Close Indian Point,” published in The Riverdale Press on July 2, 2015, HERE. And please see U.S. Representative Eliot Engel’s response to our Open Letter on July 9, 2015, HERE. BCJN members and all concerned citizens can find advice on how to help with the campaign in support of NYC Council Res. 694, HERE. BCJN is also an active coalition member of Resist AIM and SAPE (Stop the Algonquin Pipeline Expansion). 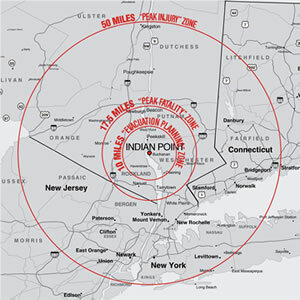 The Algonquin Incremental Market (AIM) expansion project of the Spectra Energy Corp. would sharply increase the dangers of a catastrophic “accident” at Indian Point by laying a highly explosive, 42″ fracked gas pipeline within 105 feet of critical infrastructure of the nuclear power plant. For an account of an important grassroots campaign to stop AIM based in Peekskill, NY, please go to the website of Sane Energy Project HERE. Governor Cuomo requested that the Federal Energy Regulatory Commission (FERC) suspend construction work until further safety studies are completed. FERC has refused to comply. Senators Schumer and Gillibrand oppose the pipeline. 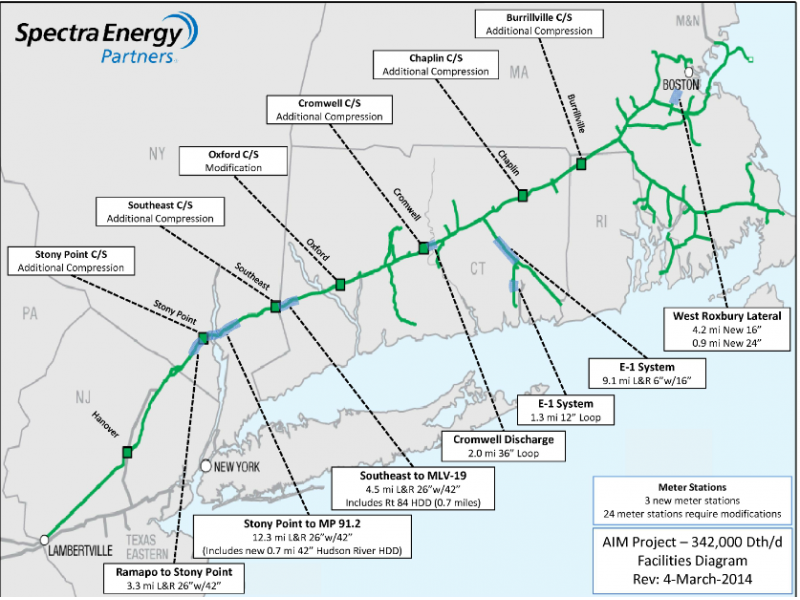 Above: The proposed route of the Algonquin Incremental Market (AIM) pipeline. BCJN strongly urges people to sign the online Resist AIM “Pledge of Resistance.” In doing so, you will be added to the listserv of Resist AIM and receive notifications about the many ways to support the movement against the pipeline, including by risking arrest in well-organized, peaceful civil disobedience. Please note that there are many important roles to play in supporting this effort — if risking arrest is not comfortable or advisable for you, you can help in many other ways. In addition, fundraising for Resist AIM is ongoing and essential in paying for the court and legal fees incurred by those able to risk arrest. To make a donation online or by check, please go to the Safe Energy Rights Group (SEnRG). BCJN members have been involved in assisting Resist AIM in many ways, from engaging in civil disobedience, joining non-arrestable protests, providing court support, assisting with media outreach, and donating. One of our members engaged in non-violent CD as one of the Verplanck 11 on Februrary 29, 2016. 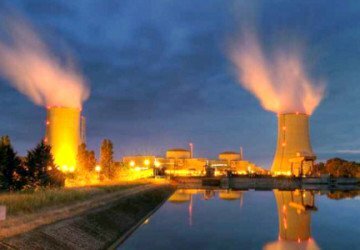 If you are interested in risking arrest or becoming active in other ways with this extremely important effort to combat the twin dangers of fossil fuels and nuclear energy and would like to learn more, please email: bronxclimatejusticenorth@gmail.com. For an important media piece about civil disobedience and the grassroots anti-pipeline movement, go HERE. Above: The Verplanck 11, joined by Resist AIM supporters, outside NY State Police headquarters in Cortlandt, NY on February 29, 2016, after being arrested and charged with disorderly conduct for blocking access to Spectra Energy work sites near the Hudson River location of Indian Point.